As you know, there will be no Europolla. Last polla winner has invited a bunch of us (interested? leave a comment) to join an ESPN Fantasy League for the Euro. I tried joining, but apparently the internet has finally caught up to me and they have me flagged me as a filthy word. I called customer support and they verified that I’m filthy. In order to play, I need to come up with a fake user name and last name. I’ll make sure to teach them a lesson and come up with something truly filthy, like “poo” or “vomit” or “dirt”. Click on the screenshot below to see the full error message. Additionally, the following processing errors were encountered. These are listed below in order to help you determine the problem. 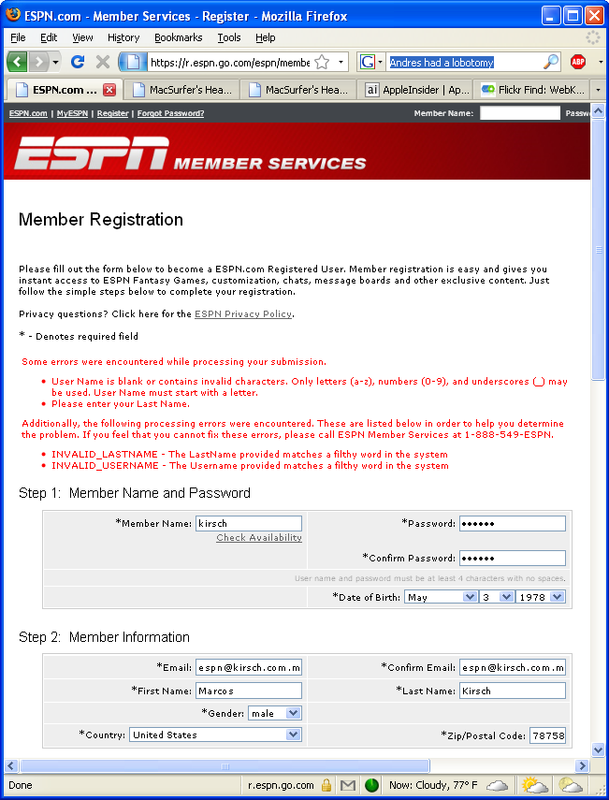 If you feel that you cannot fix these errors, please call ESPN Member Services at 1-888-549-ESPN. Good look changing your name… at least people won’t relate me to you anymore (THANK YOU ESPN). A great reason to promote web censorship.